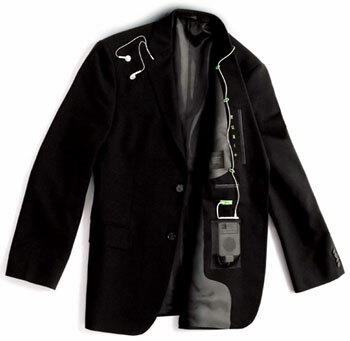 Bagir Ltd., a manufacturer of tailored clothing, has introduced the Play List Jacket, a design which is exclusive to Express Men, that offers iPod support integrated into a blazer. “It’s the only tailored jacket in the world that has been specifically designed to be compatible to iPods,” says Offer Gilboa, CEO of Bagir, which has been given a “Made for iPod” authorization from Apple for tailored clothing. A strategically placed pocket has been designed to hold an iPod, while earphone wires can be set in place via hidden loops on the inner lapel. Want to change the music, pause, rewind, or adjust the volume? You can adjust the iPod through soft touch controls that are built into the inner lapel. The jacket will be available at Express later this month and will retail for $248. Coordinating pants are will also be available. “Our company has targeted this unique jacket collection to the customer who is in the business world, likes stylish clothing, and is in step with the newest electronic innovations,” adds Gilboa.